If you’ve been around the WordPress community for quite some time, you surely are familiar with WordPress theme clubs, popular or otherwise, and how they work. For those just getting their feet wet regarding everything WordPress, check out our previous article, What is a WordPress Theme Club for a quick run through on theme club basics. For the WordPress newbie, here are some of the more popular and still active WordPress Theme Clubs to explore. Elegant Themes is one of the most popular WordPress theme clubs, with over 170,000 customers. They currently have more than 81 themes, releasing new themes regularly. Elegant Themes offers its members access to a variety of themes that range from portfolio themes, to business themes, to blogging/news themes, to eCommerce themes, to personal themes. Their themes have a distinct style that combines aesthetic and function seamlessly. Elegant Themes offers 3 different membership packages: Personal, Developer and Lifetime options with access to more than 81 themes, shortcodes, and other benefits. The Genesis Framework and child themes by StudioPress have been around for quite some time as well. Founded by Brian Gardner (Copyblogger), StudioPress has been churning high quality coded WordPress themes for years. StudioPress is different from Elegant Themes in that they sell themes individually in addition to the club membership. With over 86,000 members and 43 themes for a one-time fee of $349.95 which includes lifetime access to all of the current StudioPress themes, all future themes, and updates to all themes as they become available. 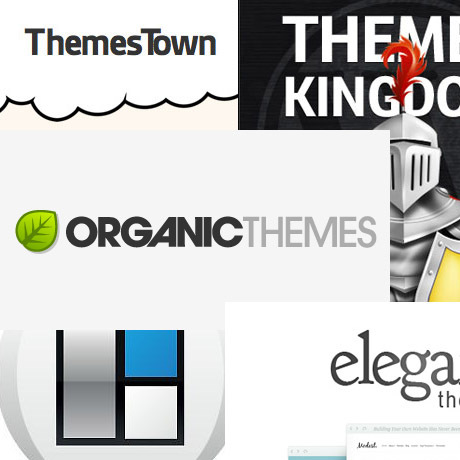 Themes Kingdom offers all of their themes (currently 47 themes), plus 1 plugin (Scebo, for a customer support system) for $50 per year. Members can use the themes on an unlimited number of domains, including on client websites. Themes Kingdom members get access to attractive themes in a wide variety of categories, including portfolio themes, business themes, blog themes, news themes, and more. Organic Themes was founded in 2009 by David Morgan and Jeff Milone and was developed as an expression of their personal lifestyles. Their design approach lean towards the more professional look sans the excessive flashy effects, gradients, drop shadows and other bells and whistles commonly seen in the web design world. They are committed to clean code, with just the right amount of theme options which translate into faster load times, setup and customization. Organic Themes offers a variety of premium WordPress themes for artists, businesses and bloggers. ThemesTown is one of the new kids on the block that’s worth watching. If their impressive and creative website design is a gauge of what can be expected from them, then there is much to look forward to. Right now, they are building up their depository of homegrown exclusive premium themes but while you are waiting, you can also check out their huge list of the best free WordPress themes that have been culled from what’s out there. Membership rate is pegged at $55 one-time fee, with no monthly dues and no future charges.